If you're an entrepreneur or senior manager, chances are you don't have much time for the morning shave. Can these Bulldog products get you looking sharp, fast? MT puts the range through its paces. When you hear the word 'Bulldog', most people will think of the animal or that annoying nodding dog on the TV. Some might even think of legendary British Wrestler Davey Boy Smith. What doesn't spring to mind is skincare products. 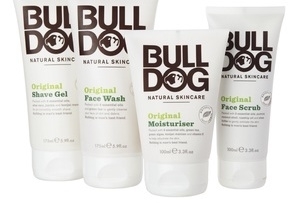 Bulldog Natural Skincare for Men looks to provide an alternative in the male grooming market. They take pride in their natural ingredients, spurn nasty parabens, use recyclable packaging as part of their environmentally friendly focus, and also refuse to trial their products on any animals. The question is, however: are they any good? MT examines three of Bulldogs products below. Call me old-fashioned but when I rub my hands together, the last thing I want to feel is like I have half of Blackpool Beach on my fingertips. But that's what 'scrubs' are all about, apparently. The texture feels almost sand like on your hands and literally scrubs away all the grease and impurities on your skin. I was worried that I would be picking bits of coconut shell and pumice off my face for days, but the Bulldog Scrub washed away easily and didn't even stick to the sink, which is useful when you're in a hurry of a morning. As the strapline reads, 'Scrubbing isn’t a chore: it’s a talent'. 'Unless you’re a geography teacher or a communist revolutionary, you’ll have to shave sometime'. With a strapline that’s good for a giggle, Bulldog’s shaving gel boasts 'eight essential oils' - seven more than this writer thought existed! According to the blub, 'aloe vera', 'jojoba' and 'konjac mannan' (yeah, me neither!) combine together to provide a lemony/citrus like smell that might make you think you’re doing the washing up. Fear not however. For those looking for a quick, sharp shave, the gel is easily absorbed, and after shaving leaves your skin feeling fresh and moisturised. All for just £3.99. Bargain. Does exactly what it says on the tin. Easily and quickly absorbed by the skin, it leaves your face and neck feeling refreshed and smooth. It's more expensive than an own-brand supermarket product or no frills version at £6.99 for 100ml - but significantly cheaper than many women's skincare products promising the same benefits. For those doing a lot of travelling, or who want to keep a moisturiser in their manbag for a pre-pitch/presentation touch up, it’s pretty perfect.